2019 Chinese Traditional Spring Festival is coming!!! Guangzhou Teehon Electronics Co., Ltd. and all staff sincerely thanks for all customers support and assistance over the past year. Given the Chinese New Year approaching, wish you happy new year, all the best! 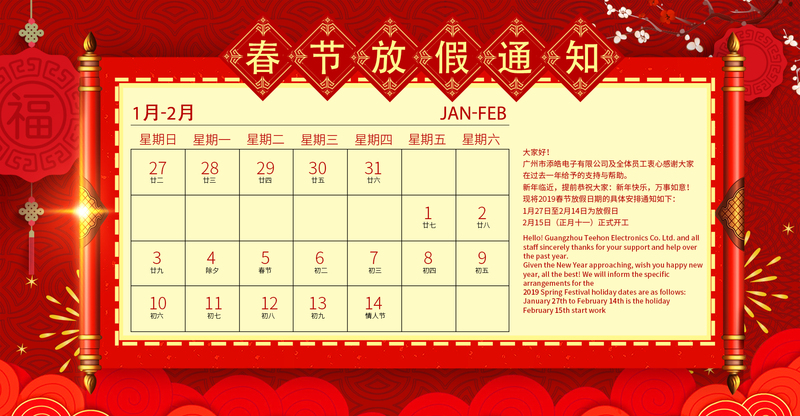 From Jan 27th to Feb 14th, we will celebrate the the Spring Festival during this period, and we will back to office on Feb 15th. Sorry for anything inconvenient to you and please feel free to contact me if you have something urgent to get answer.